While we were staying in Sidney (British Columbia), Jenny and I did a PADI dry suit course. I've often seen British Columbia listed as one of the best places to dive in the world. Given that I enjoy diving and frequently visit the region, I figured I had to give it at least once chance. Of course the water is a tad cold so there was no way I wanted to do it in a wet suit hence the dry suit course. We did the course with Sidney Surf n Dive and while they're nice folks, I can't say I was overly impressed with their ability to run a course. We got there on Friday morning at 10 but it took 2 hours to collect all the gear we needed together. I then found out I needed my own transport and had to fetch my Dad's car. We got to the pool to find out someone had goofed and didn't book it in the first place! That killed the day and the instructor left to go back to his real job. Lots of apologies but we were pretty disappointed. We were called back later that afternoon and the owner promised to look after us personally and take us out on his boat on Monday and we could do the pool session that evening. And he would throw in a discount. We gave him a second chance and proceeded with the pool session at another instructors own home pool and it went well enough (picture above). It's an easy session just to get familiar with the dry suit and learn what to do if you get upside down. Come Monday, I was looking forward to a boat dive at a well known local wreck called the G.B. Church. However, we had bad news when we arrived at the shop. The owner had broken his finger the previous week and couldn't take us out. Jenny was taking all this bad news as an omen and seriously wanted to quit the whole thing. We settled on going with another instructor (our 3rd) for a couple of easy and shallow shore dives. We did the dives. Both Jenny and I were underweighted which meant we couldn't put enough air in the dry suits. This resulted in minor leaks and runaway ascents. I should have just put rocks in my BCD but didn't think about it at the time. Jenny was maxed for the lift capacity of her BCD. The maxium depth was only 13m so bouyancy control was never going to be easy. The water wasn't cold at 19 celsius but I did have two full layers of warm clothes. One layer was regular ski thermals. Then I had sweat pants and a fleece jacket on top of that. It's certainly more awkward than a wet suit. The visibilty was poor and there wasn't a whole lot to see where we went. Some small fish, crabs, starfish, a nudibranch and one small curious shark. It was ok. 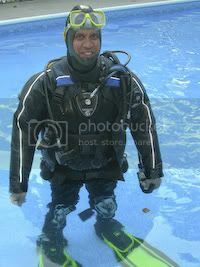 So my conclusion is that cold water diving is bearable in a dry suit although very cumbersome. Dry suits are not really dry but more like what one instructor said, "variable damp suits". You need a lot of extra weight; 33 lbs was not enough for me. All three instructors had different opinions on how you manage both the BCD and dry suit which is still a bit confusing. Nevertheless, we're now both supposedly "qualified" to dive in a dry suit. The reality is that it would take several more dives in a dry suit to feel qualified. I would still like to dive a nice site in BC but I'd go with a different dive shop.